Problem: hypertrophic tissue has developed in the TEP area, interfering with the voice prosthesis position and/or function. This phenomenon may sometimes occur when the prosthesis is relatively short, leading to bulging of the tracheal mucosa over the tracheal flange. 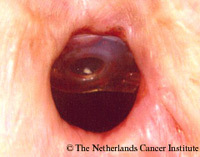 This excess tissue can often be removed by using a laser (CO2 or NdYAG), without having to remove the voice prosthesis. Alternatively, a longer prosthesis can be used. The top figure shows a mild form of hypertrophic scarring. There is excess tissue formation that pushes the prosthesis outwards. This tissue also can be removed with the NdYAG laser (or with ordinary cauterization equipment, of course). The result 2 weeks after this treatment can be seen in the lower figure. Another example is shown in the lower 3 figures. The first picture shows the excess tissue, the next the situation after diomed laser removal and replacement of the vice prosthesis, and on the last picture the removed tissue is shown.